Perched on a high vantage point above Clayton, Clayton Heights and Thornton and overlooking the City of Bradford, Queensbury is one of the highest parishes in England, enjoying views far beyond the West Yorkshire conurbation. Indeed, the "Mountain" end of Queensbury is one of the very few places in the country where it is said that - on a (very) clear day no less than three of England's national parks can be seen from the same point - the Peak District to the south, the Yorkshire Dales to the north and the north west, and (in the very far distance) the Hambleton Hills on the edge of the North York Moors across the Vale of York to the north east. 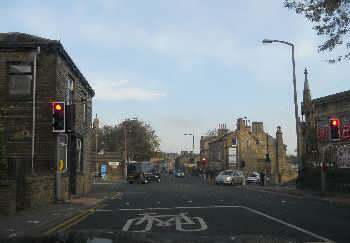 Queensbury itself is most famous as being the home of Black Dyke Mills, and the internationally renowned Black Dyke Mills Brass Band, as well being where Percy Shaw got the inspiration for the invention of "Cats Eyes" on the road to Halifax near Mountain. IMPORTANT: The above links may refer to external websites whose content, products and/or services are not necessarily recommended or endorsed by Eagle Intermedia. Bronte Country is designed, maintained and promoted by Eagle Intermedia Publishing Ltd.